Cast members Brandon Throckmorton and Jason Schlarmann. Patio Playhouse Community Theater is currently running “Every Christmas Story Ever Told (And Then Some! ),” written by Michael Carleton, Jim FitzGerald and John K. Alvarez, with original music by Will Knapp. Fans of holiday songs will delight in hearing them all, from classic to contemporary (and funny pop culture moments, too!) while this energetic ensemble touches on Christmas traditions from all over the world. Hilarious, fast-paced and family-friendly, “Every Christmas Story Ever Told (And Then Some! )” will put you right in the mood for the holiday season. The cast includes Jason Schlarmann, Payne Smith and Brandon Throckmorton. Patio is partnering with Meals on Wheels San Diego County, a volunteer-run non-profit organization that currently provides nutritious meals seven days a week to 1,500 seniors throughout San Diego County. Meals on Wheels also offers daily well-being checks, annual birthday and holiday gift boxes, and a partnership with Helen Woodward to provide weekly “AniMeals” for seniors’ pets. Dozens of corporations, organizations, military and youth groups provide over 3,000 volunteers for home visits, helping to ensure the comprehensive reach of nearly 200 daily delivery routes county-wide. Nearly 10,000 donors subsidize the cost per person for every Meals on Wheels recipient, who receive heart-healthy foods to help reduce the number of seniors who require longer hospital stays due to malnourishment. Throughout the run of “Every Christmas Story Ever Told (And Then Some! ),” Patio patrons are encouraged to support the mission of Meals on Wheels by donating any amount to hang a special ornament on the paper tree in our lobby, with the option to honor someone by name on this display. The entire amount collected will be delivered to Meals on Wheels to support their holiday goals. For more information about how Meals on Wheels is changing lives, please visit the organization website at www.meals-on-wheels.org. Tickets: Performances of “Every Christmas Story Ever Told (And Then Some! )” began November 16 and continue through Sunday, December 16, with no performances the weekend of Thanksgiving. 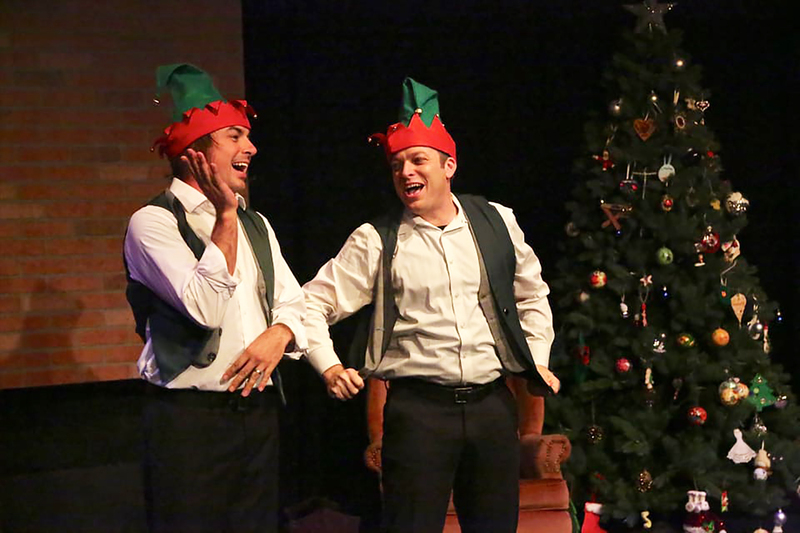 Performances will run Fridays and Saturdays at 8 and Sundays at 2 p.m. at Patio Playhouse’s mainstage theater at 116 W. Kalmia Ave. in downtown Escondido. Tickets are available for the cost of $20 for Adults, $17 for Seniors/Military/Students, and $12 for Youth 16 and under. Group rates are available for groups of 10 or more. For reservations, contact the Patio Playhouse box office at 760-746-6669, via email, or via the website at www.patioplayhouse.com. Directed by David Guthrie. Produced by Laurissa Rudgers. Produced by special arrangement with Playscripts.